Due to a pretty harsh cold virus taking advantage of my bodies weakened state after this race I am just now able to focus enough to get this race report out. I know many of you have wondered what happened to me. I have not been blogging actively, or commenting on other people’s blogs for quite some time. Well, February 19th 2011 and the Iron Horse Endurance Run has finally came and went and I survived This race was to be my first 100 mile ultra-marathon for which I had trained hard over the past 22 weeks. It was a very challenging 22 weeks with a total of 101 runs for 1,183 miles over 187 hours and 158,500 burned calories. THAT is why I have been such a quiet blogger this past 5 months. It sure was hard to put in this much training, work full time, and still have family time. But somehow I managed, and really loved it in the process. The night before the race I ate everything in site to ensure I had enough calories to load up as much as possible. Now, I am not a fan of Golden Corral, but it served the purpose that night. I always feel slightly out of place when I go to one of these places since I am not over-weight, and don’t really qualify as a “full” red neck. (I see your head nodding, so you know what I mean.) I know not everyone in that place fits my description, but I was very much in the minority. As I walked around the trough to get some food I could feel the eyes on me as if to ask, “Why are you here? You don’t belong.” I was like a Chimp surrounded by a group of Gorillas who are wondering why I am eating their bamboo. My plans for the race were pretty simple. I planned on running the full 100 miles in 21 hours, and would take in 350 calories/hour and about 15 ounces of fluid/hour also. To do this I was drinking HEED from a CamelBak, eating GU gels, and also drinking Perpetuem from a 20 ounce bottle. The idea was to refill the CamelBak every 3 hours with HEED, eat one GU every 45 minutes, refill the Perpetuem every 4 hours, and drink water at the aid stations every 6 miles. I also planned to eat 1/4 PBnJ (peanut butter and jelly) at each aid station. Also, each lap of 25 miles I would try to eat something solid as I rested for about 20 minutes. The first 25 miles went pretty well, and I completed the lap in 4:40. I stayed on time with my fueling and hydration, and all felt pretty good. The day was starting to heat up though, so I felt I should slow down a bit. I refilled the CamelBak and Perpetuem bottle, picked up more GUs and headed out for the second lap feeling a little hot but OK. Looking back I realize I should have put on sunscreen at this point also. About half of the course was not covered, and I did get some slight burns. A non-Floridian would probably get fried. The second 25 felt OK as my wife and son ran with me for the first 3.5 miles and commented that I was starting to look tired. This became much more obvious about mile 34 when I realized I had not urinated for awhile, and my fingers were a little swollen. I realized the temps were in the 80’s and were taking a real toll being higher than I had planned and I needed to increase my fluid intake quick. To handle this I started drinking from my CamelBak more often, and drank more plain water at the aid stations. While I caught it in time to get my fingers swelling down, it was still awhile before I had enough surplus to urinate. I finally had the urge to go again around mile 43., and noticed that my body really didn’t want to accept any fuel. The damage was already done as I finished the second lap at the 10:44 mark. As I took a break at the 50 mile mark I knew my body needed fuel, but I had no appetite at all. Nothing sounded good, I was not feeling pleasant because of my slight cold, and I still had 50 miles to go. I forced down 1/2 PBnJ, and an orange half, and drank some plain water. At this point I contemplated dropping out. If I could not fuel up properly I knew I would not last long, but decided to head out and see how I felt after the first 3.5 miles. As I headed out I felt pretty bad, and my condition did not improve even though the sun was down. After knocking out the first 3.5 miles I decided to sit for awhile and force down a sausage sandwich as my wife prepared the CamelBak and Perpetuem. I was completely beat, but was not ready to call it quits yet. After about an hour (may have been less, but it felt like an hour) I was feeling pretty good so headed out to continue the 3rd lap. It was dark at this point, so I was running by the light of my headlamp. My wife ran with me for the first mile, then turned and returned to the aid station while I continued to run in the dark. It was kind of creepy running through the woods, in the dark, and hearing leaves rustle all around. The most spooky thing was running along, and then hearing little footsteps in the dried leaves that sounded like they were following you. (Tshhh, tshhh, tshhh, tshhh.) So I would shine my headlamp in the direction of the footsteps and they would stop. I was still feeling pretty good and made it to the first aid station about 4 miles later. I was hopeful they would have some soup because I was still not able to take in much fuel except for drinking HEED. At the aid station I was in luck and they did have some lentil soup. I sat long enough to finish a cup of soup, and then headed out. I was thinking really hard about turning at the 100K marker and finishing the race in 4.5 miles, but was not sure. My body made the decision for me when I started shivering from head to toe. Here I was running and feeling warm, yet still shivering. I realized my body had nothing left, and made the decision to follow my gut and call it quits at 100K. I managed to run the last 4.5 miles back to the finish line. I completed the 100K in 14:40 (my Garmin time). The official results are not posted yet, so I will come back and edit this after they are posted. With all of the stops, and time spent trying to recover enough to complete the 100 miles, it caused the last 12 miles to take me 4 hours. While technically this was a DNF, the race coordinator was kind enough to let me still claim a 100K finish. So I have my first belt buckle. Last year I did not notice how sharp, and how many, rocks there were on the course. I believe this was partially due to wearing ‘cushion’ shoes last year, and this year I was wearing ‘stability’ shoes. By the end of the race my feet felt like hamburger, and were swelled up for 3 days. I think the fact that my shoes were also due to be changed helped in the matter, with less sole to protect my feet. I should have drank more fluids earlier on at the rest stops to make up for the added heat. By the time I realized this I had already blown the race. My wife offered to run with me more than she did, and because I was already miserable I refused. Next time I will inform my pacer to just run and not ask me if I want them to. I should have forced down some more food after mile 25, rather than wait until 50 when my body was more worn down. Be more careful NOT to catch a cold virus a few days prior to a race of this magnitude. Not sure how I could have been more careful of this, but I do know that having a cold sucked. Take more salt tabs or Endurolytes each hour in heat. I had forgotten that during the cool months of training. Change my shirt each 25 miles. This will cut down on my bodies usage of energy to stay cool/warm. 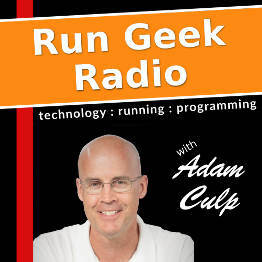 Have you ever considered a walk/run ratio? I’ve been reading a lot and it appears that even the big ultra runners favor this plan and just wondered if you tried it and if it helped. Regardless, I am so proud of you, Adam and so glad the race director gave you the belt buckle! Congratulations on a job well-done! Some things are beyond our control no matter how much we plan. You put the long hours and the hard miles of training in- I watched in awe as you logged some very long runs and crazy high mileage weeks. Sorry you came up a little short this time but I have no doubts that you will crush a 100 miler before long. 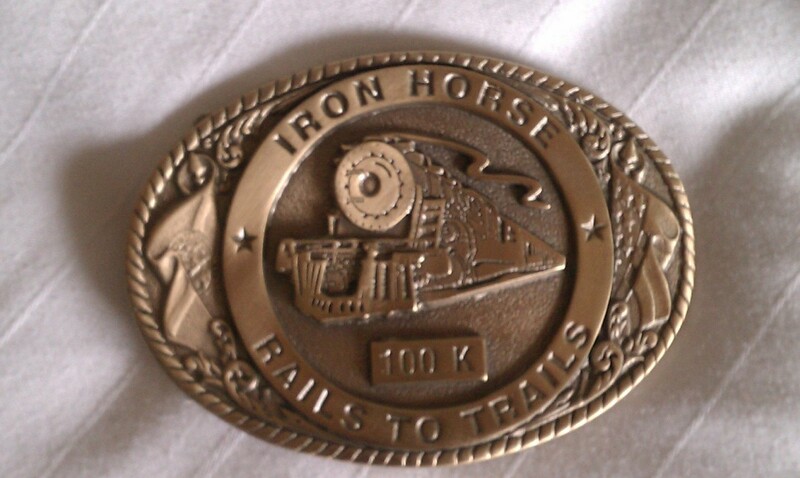 Congrats on the 100k- and a very nice buckle. Glad you bagged the 100k. 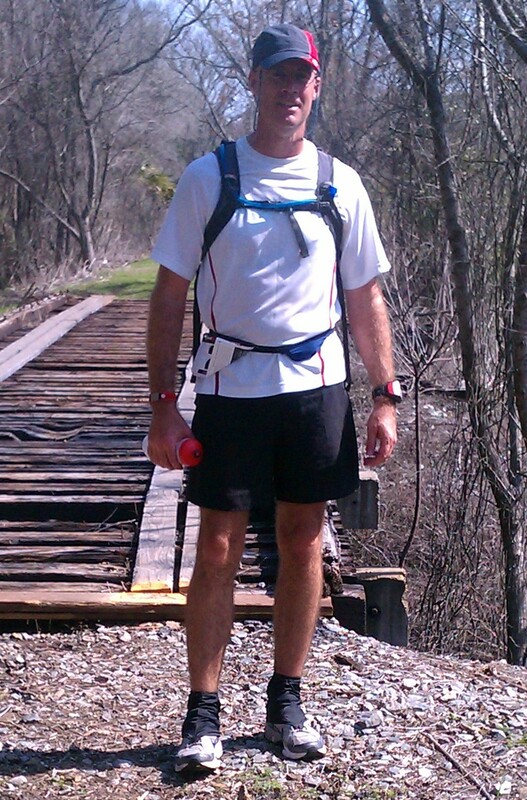 I aspire to do a 50 miler/100k someday…starting with a 50k in April. On to the next 100..if I lived closer I would offer to be a crew person..
Adam, you did great! 100K is still a major accomplishment in my eyes. Sorry it took me so long to finally get over to read your RR but i was thinking about you. I think we have been in the same boat with work, fam, training, and very little time left to blog, read other blogs and much less comment. I LOVE that belt buckle. After seeing that, I want to do one just for the buckle. Maybe not 100 miles but I could do 100K one day. Thanks for the great report! Sorry to hear that you didn’t get to the 100 mile mark, but that’s great you did get to 100k and was able to get the belt buckle. I’ve signed up for the 2012 100K and find all these details to be valuable in painting a picture of such an unknown for me.